Your applique quilt blocks are washed, dried and pressed. It's time to square them up. Squaring up creates corners with perfect 90 degree angles. And that makes for easy piecing! ...if you spend much time appliqueing. It is easier to use for this process. Use one that is as large or larger than the applique blocks you are trimming. If you marked the horizontal and vertical center lines for your placement marking guides, squaring up is pretty easy. Determine the block's Cut Size by adding 1/2" to the finished block size. Determine the Halfway measurement by dividing the Cut Size by 2. 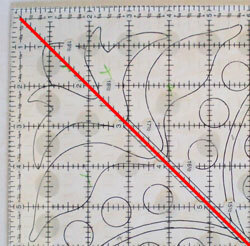 Place your square ruler over your applique block. The "0-corner" of the ruler is at the upper right. The Halfway measurement markings on your ruler match up with the top and right edge of your original centering lines. Trim the top and right edge with a rotary cutter, once you are satisfied the appliqued design is sitting in the center of the block and that no applique is less than 1/4" from the cut size edges. You don't want to sew your applique into the seam allowance. Remove the ruler. Turn the block 180 degrees and position the ruler with the vertical Cut Size measurement aligned with the left edge of the block. The horizontal Cut Size measurement is aligned with the bottom edge. Check that the intersection of two Halfway lines is positioned at the center of the block. Trim the top and right edges with a rotary cutter. Your applique quilt block is squared up. 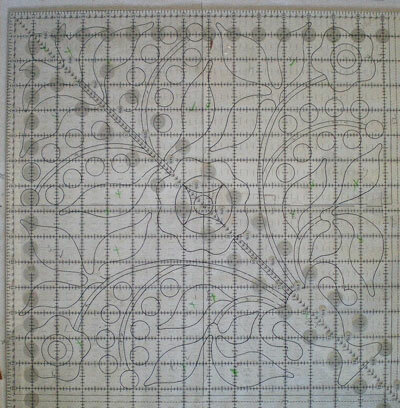 If you used an overlay or light box to position the applique shapes, you may not have marked the horizontal and vertical centers of your block. If you did mark, it's possible that washing the blocks removed the marks. What to do? Refer back to your original pattern. ﻿Is there a shape in the center to line up the ruler with? What shapes are closest to the edge of the block? How far from the edge are they? Finished block size is 15"
The center circle of the center flower is the center of the block. The center stem is centered on a line diagonal from the upper left to the lower right corner. The edges of the outside leaves are a scant 1/2" from the outside edge of the unfinished block. The bottom edges of the urn are about 5/8" from the edges of the unfinished block. Position the ruler on the applique block, using all the information above...double and triple checking. You don't want to cut your block too small now! Trim the top and right edge. Flip the block 180 degrees. Line up the cut block edges with the 15-1/2" (cut size) lines of the ruler. 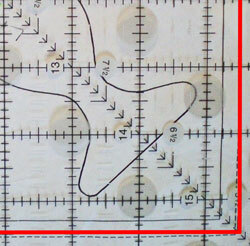 Check that the 7-3/4" lines cross in the center red circle. Is the 45 degree ruler line on the center diagonal stem? Once everything is lined up, the final two edges are trimmed. Repeat for your remaining blocks and they're ready to be pieced into the quilt top. "The Ultimate Applique Guide Book"
Regardless of the method of applique I use, these are some of my go-to tools.